Some specialized products are more expensive than others and hence require packaging stickers that are according to their own style and luxurious standards. For these types of luxury products, Go Stickers offer the highest quality and most beautiful Silver Foil Stickers. Our luxury stickers come in various shapes and sizes and are able to provide marvelous looking and long lasting packaging stickers for various luxurious expensive products like jewelry, watches or perfumes. 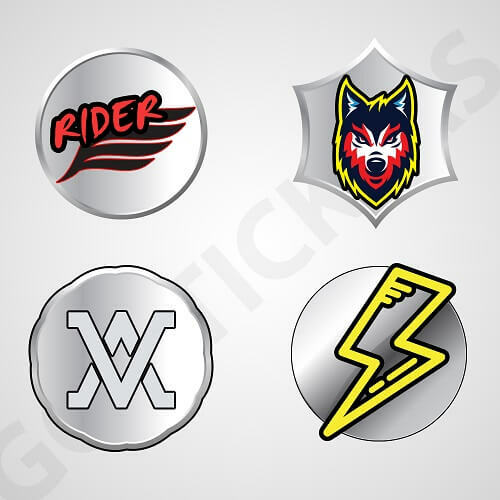 The specialized foil stickers in silver by Go Stickers are manufactured using materials of the highest level that keep their shine and superior finish for the longest time possible. Additionally, on bulk orders along with producing the cutting die equipment and printing plates ourselves, we also provide free delivery all over the US. Customized Silver Foil Stickers are able to provide design embellishments of the highest levels that are unmatched by many other forms of custom packaging. 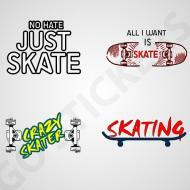 Go Stickers produce outstanding foil stickers in silver color that have the desired highest quality design embellishments along with materials that provide the long lasting new shiny finish that is exactly in line with the nature of the products that are to be packaged in them. These stickers also have the strongest adhesives used in their under-layer that allows them to provide flattest and strongest stick that is not found on any other similar stickers by any of our competitors. We use only the top quality materials and finest quality beautiful design embellishments. When it comes to more demanding packaging stickers like the foil stickers that are required to provide extraordinary design appeal and beautiful artistic long lasting finish, the perfect combination of decades of experience, unmatched skill and superior state-of-the-art equipment that Go Stickers have is all that is required to fulfill all the superior designs and finish requirements from them. Go Stickers are able to use the best quality materials and process them on our high-tech equipment and provide the most beautiful Silver Foil Stickers with highest quality finish that have the ability to enhance the appeal your products will have once they have our stickers pasted on them and rest on the shelves in supermarkets or retail stores for selling purposes. 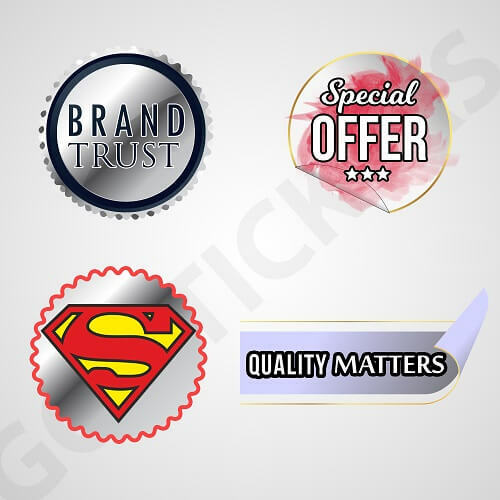 Having decades of experience in the custom stickers industry, Go Stickers are able to cut all the unnecessary costs using our stable and efficient sourcing and manufacturing channels. We produce the most reliable Wholesale Silver Foil Stickers that guarantee all the high-quality traits you would normally get regardless of how big or small your wholesale order is. Cutting costs for Custom Silver Foil Stickers by dropping material and finish quality is not how Go Stickers operate our business in the industry. 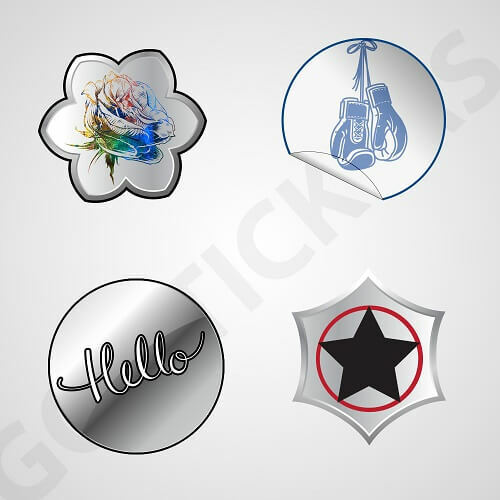 Go Stickers has the most well-developed, experienced and skilled team of customized silver color foil stickers designers who are able to deliver the most extraordinary and unique looking designs possible. Go Stickers also offers the most dependable and free of cost design assistance where our experts help our clients design several models for their personalized foil stickers and then finalize the one that suits their needs perfectly. Regardless of how complex or unique is the design our clients choose, our state-of-the-art 3D printing equipment and other relevant stickers designing equipment ensure that those selected designs get produced in the most efficient way possible. The perfect combination of all the resources required to deliver the most beautiful Custom Silver Foil Stickers allows Go Stickers to produce the shiniest and finest quality finish for them that will stay good as new for the longest time possible. We pass all our foil Stickers designs through multiple steps of manufacturing and quality assurance that guarantees the most attractive and beautiful finish for them at all times. 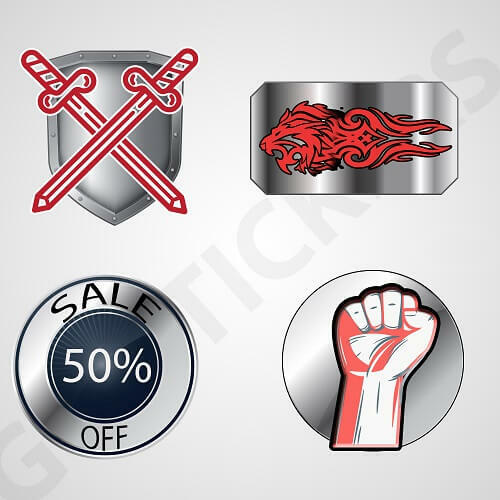 If you are a luxury product manufacturer or retailer and are looking for the most appropriate and beautifully embellished Custom Silver Foil Stickers for packaging purposes of your expensive products, Go Stickers will provide you with stickers that are manufactured using materials of the highest quality and will keep their finest shiny finish for the longest time possible at the best wholesale prices in the entire industry. Our special offers also include free delivery on bulk orders along with no added costs for the printing plates or cutting die equipment as well. We provide you the most profit enhancing packaging stickers with a best quality guarantee.